Europe's Rosetta probe captured this photo of Comet 67P/Churyumov-Gerasimenko on June 1, 2016, after recovering from a glitch. Rosetta was just 5 miles (8 kilometers) from the comet when it took the picture. The comet-studying Rosetta spacecraft has bounced back from a glitch that incapacitated it over the weekend, European Space Agency (ESA) officials said. Rosetta — which has been orbiting Comet 67P/Churyumov-Gerasimenko since August 2014 — went into a protective "safe mode" on Saturday (May 28), apparently because the spacecraft couldn't lock onto distant target stars and orient itself properly. The team eventually managed to reconnect with Rosetta, stabilize the spacecraft and get its science instruments back up and running. 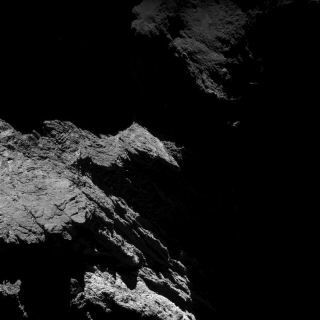 "It was an extremely dramatic weekend," Sylvain Lodiot, ESA's Rosetta spacecraft operations manager, said in the same update. Rosetta's star trackers use an autonomous star-pattern-recognition function to manage the probe's orientation. When in the correct position, Rosetta can send and receive signals to and from ground stations on Earth. Comet 67P isn't just a rock in space; it constantly spouts dust and gas that remain in a cloud around the icy object. Although the shedding material reached its peak when 67P passed closest to the sun in August 2015, plenty of material remains, and Rosetta can occasionally mistake the debris for stars. That's what apparently happened over the weekend, when the spacecraft was just 3 miles (5 kilometers) from the surface of the comet. Rosetta went dark, and its science instruments automatically switched off. Mission team members immediately got to work trying to recover the silent probe. Ground stations in Australia and Spain reallocated time originally allotted for ESA's Mars Express orbiter to help the recovery. "After we lost contact, we sent commands 'in the blind,' which successfully tackled the hung-star-tracker issue and brought the spacecraft back into three-axis stabilized safe mode, and we now have contact with the spacecraft again," Lodiot said. Rosetta's handlers were able to start moving the spacecraft into a planned 19-mile (30 kilometers) orbit around the comet on Wednesday (June 1). The final orbital correction maneuver associated with this move should take place late Friday evening (June 3), ESA officials said. ESA plans to end Rosetta's mission with a descent onto the surface of 67P on Sept. 30. The spacecraft's path will only grow more challenging in the lead-up to this grand finale as Rosetta descends closer and closer and the debris cloud gets denser, ESA officials said. "The last six weeks of the mission will be far more challenging for flight dynamics than deploying [the Philae lander] to the surface was in November 2014," Lodiot said. During the Sept. 30 impact, Rosetta's star tracker will not be part of the spacecraft's orbital-control program. But that doesn't mean there won't be other issues. "It is always possible that we could get another safe mode when flying close to the comet like this," Lodiot said. Follow Nola Taylor Redd on Twitter @NolaTRedd or Google+. Follow us @Spacedotcom, Facebook or Google+. Originally published on Space.com.